ShowerPot is a functional piece of art that effortlessly and artfully rescues some of the water we waste. The water you save can be used in gardening, cooking, and even drinking. On average, 2 gallons are wasted while we wait for our daily shower to warm up. The average five-minute shower statistically uses 10-25 gallons (USEPA). With only 50% participation (presently 70% on average recycle), ShowerPot will rescue the equivalent of 2 billion bottles of water, every day! It is estimated that 50 billion bottles of drinking water are consumed each year in North America (USEPA) - water that is becoming more and more scarce. ShowerPot can make a difference every day and effectively replace all of that water every 25 days! The average North American household spends approximately $1,000 per year on bottled water. The inexpensive ShowerPot is a stackable, attractive, versatile, and appealing tool for your home. Save gallons of water every time you take a shower. Use the water for gardening, cooking, and drinking. 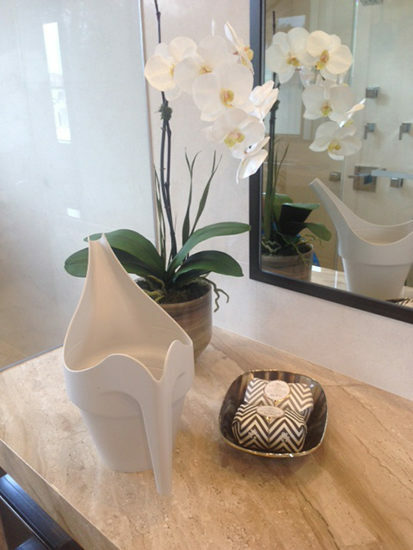 ShowerPot looks beautiful anywhere in your home. 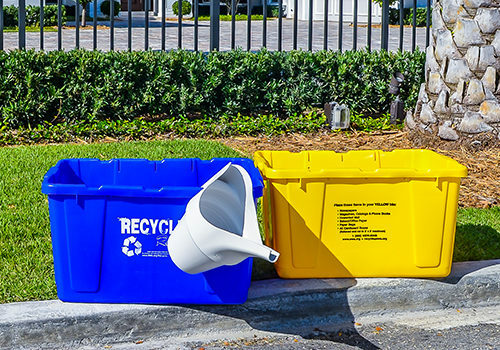 ShowerPot is perfect for environmentally concerned consumers, or public utilities, communities, and companies that want to promote water conservation. Relying on outdated water management practices, policies and infrastructure, the world’s economic future is at risk. Water shortages risk catastrophe on ecosystems, crops, collapsed industries, disease and poverty. Now is the time for fresh thinking, shared purpose and bold solutions that build a resilient water future. ShowerPot is an artistic, highly stylized pitcher designed to rescue maximum water, that we would historically waste. ShowerPot can be placed under a leaky faucet or under a drain spout. ShowerPot is an ever-present reminder to conserve water. ShowerPot water can be conveniently reused for plants, pets, cooking, even clean, safe, BPA free drinking. ShowerPot water can be safely used for cooking and human consumption. ShowerPot water is preferred by pets. ShowerPot will soon offer accessories, including stands, filters, racks, docking stations for rainwater downspouts and more. 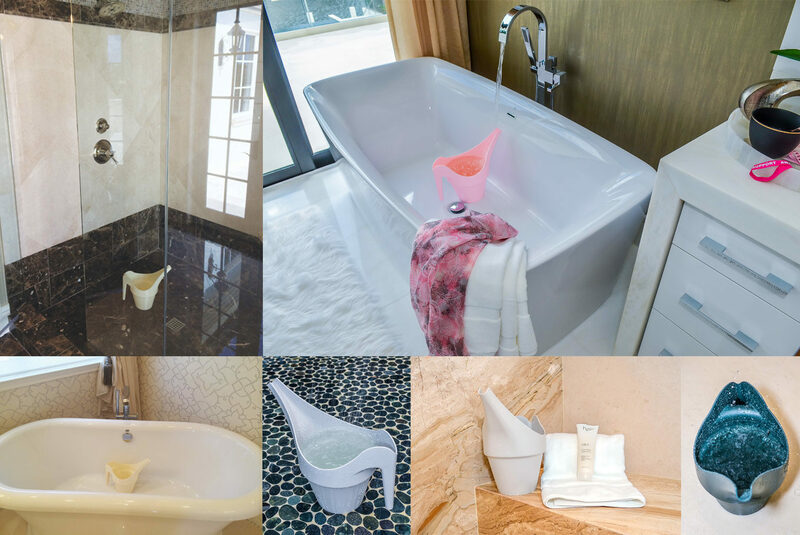 ShowerPot is available in various colors and can be ordered to match any brand, city, or corporate color. 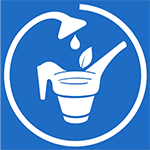 ShowerPot TEACHES us to reduces water consumption, improves stewardship and protects future water resources. ShowerPot “connects the drops” between sustainable water supplies and the economic health of our country. An average household that switches to ShowerPot can easily save $1000 a year, the same amount that is reported to make the difference between “making ends meet and not”. ShowerPot can replace the 50 billion bottles of water consumed each year in North America in just 25 days, with 50% participation. Only 23% of these bottles actually make it to recycling, while the balance continue to pollute our oceans and landfills.